Turn up the heat on the competition when you advertise your brand on this solar thermos hygrometer! The built-in solar panel powers it by using energy from the sun or ambient light. It can be used both indoors and outdoors to monitor the temperature. The hygrometer displays the high and low of the day and it's also equipped with a built in calendar. 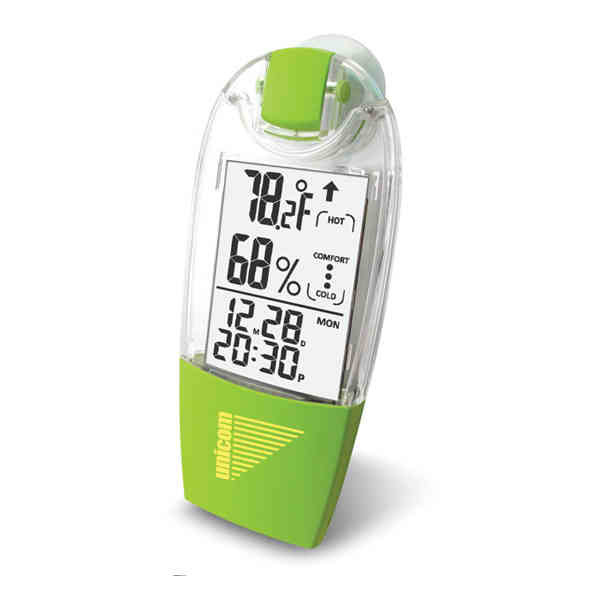 It has an upgraded new feature of the hygrometer that measures the humidity and displays a comfort index. The suction cup can be switched from front to back (or back to front) to suit each recipient's situation. Boost recognition for your brand! Size: 3 21/32 " x 1 11/16 " x 9/16 "
Imprint Size:1 1/16" x 7/8"